What is a Bumper Crane? Always there when you need it, yet never in the way. 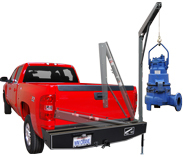 The Western Mule Fold-A-Way Bumper Crane line is designed to offer a means of lifting a load safely and quickly into your vehicle while reducing your man-power requirements. Replacing the vehicle's existing bumper, the Fold-A-Way Bumper Crane remains out of your way when not in use. The crane folds away into the bumper for convienent storage and easily folds out in seconds, ready for work whenever you need it.